Reputation management is always a moving target on the Internet. With Yelp and other review websites becoming increasingly popular, these websites can contain negative and positive reviews. Businesses trying to handle online reputation management on their own could quickly get overwhelmed. One way to make a great impression on your potential customers is through managing these websites-replying to reviews that are good or bad. The reason why this is so important is that it shows that your store cares; it lets users know that the business is glad to get feedback that can help them improve their store or to send along positive comments to their staff. Surviving negative reviews is just the nature of the beast known as the Internet. It’s businesses that address the problem that was addressed by a customer versus just sticking your head in the sand, hoping it goes away. We have found that by addressing issues raised by one or more customers, we can in turn make that negative review a positive one for the business. Customers just want their voice heard, and their problem addressed. Seems simple, yes? Unfortunately, not every business follows this path and will end up with a poor reputation. Remember that reputation is key for any business, whether online, offline or both. People talk, people research: what will they find if they Google your business name followed by reviews? Will these potential customers find unsavory comments about your store? It’s super important to reach your customers, and having a great reputation is at the start of that plan. Get a bad review? Don’t stick your head in the sand and hope it will go away. Reach out to the customer and work with them. In most cases, it was a misunderstanding or perhaps the customer service wasn’t as good as it usually is on that particular day. Reputation Management is hard work. It’s much like doing a constant campaign for an elected office. There will be ups and downs along the way, but it’s how you address what your customers are saying about your business. 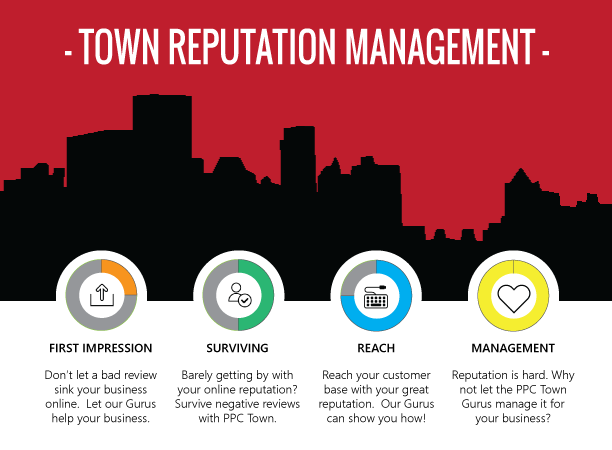 PPC Town’s Reputation Gurus are excellent in helping your business achieve this by facilitating communication with your customers. They will interact with customers online on behalf of your business and relay pertinent information to your business.